The MOC301XM and MOC302XM series are optically isolated triac driver devices. 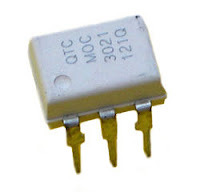 These devices contain a GaAs infrared emitting diode and a light activated silicon bilateral switch, which functions like a triac. They are designed for interfacing between electronic controls and power triacs to control resistive and inductive loads for 115 VAC operations. 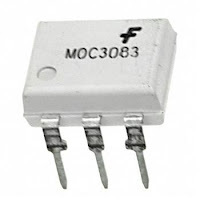 The FOD4118 device consist of an infrared emitting diode coupled to a hybrid triac formed with two inverse parallel SCRs which form the triac function capable of driving discrete triacs. The FOD4118 utilize a high efficiency infrared emitting diode which offers an improved trigger sensitivity. These devices are housed in a standard 6-pin dual in-line (DIP) package.